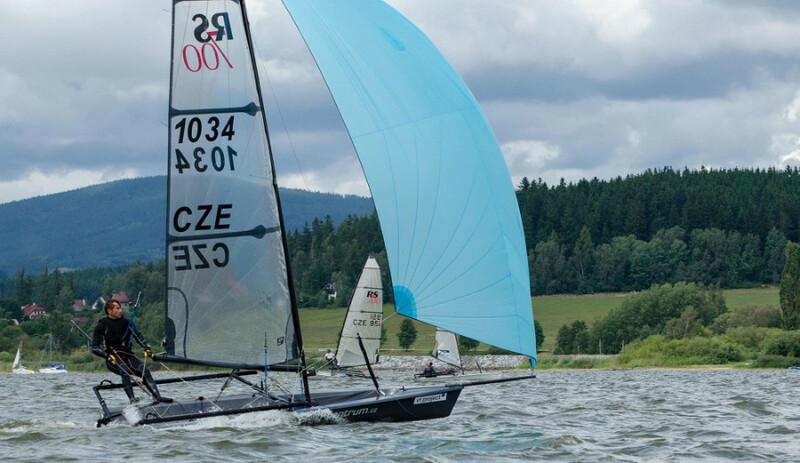 Lake Lipno in the Czech Republic was the spectacular venue for the 2017 RS700 European Championship held between 17-20 August. 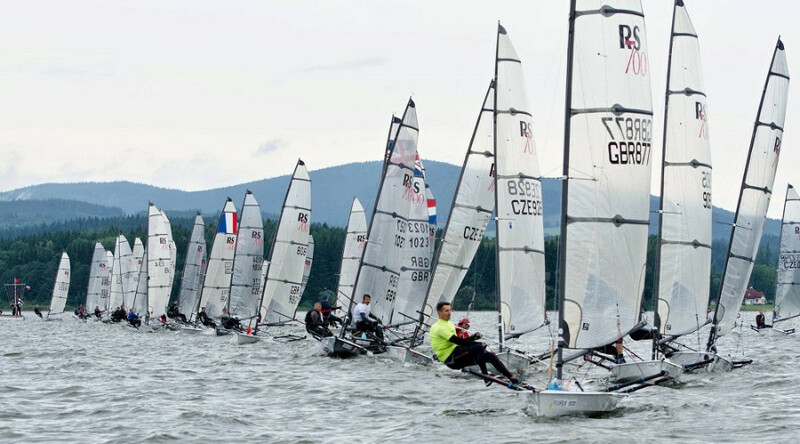 This was a record breaking European event with 38 boats in attendance, representing The Czech Republic, United Kingdom, Austria, Belgium, France, Germany and the Netherlands. 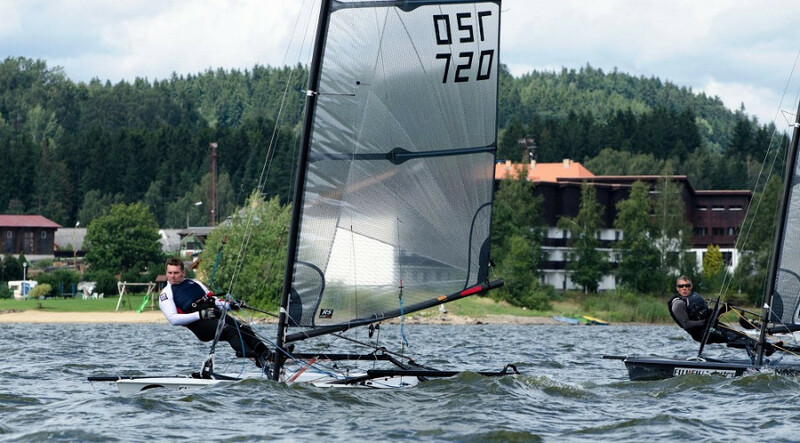 Whilst a 1700-mile round trip across 5 countries to a central European lake not well known for its windy conditions might not sound that appealing, for the UK sailors that made the journey, they experienced some very competitive racing, fantastic event organisation and incredible Czech hospitality. Days 1 and 2 Light winds and 30 degree temperatures were the prevailing conditions for the first 2 days, and whilst the competitors launched and had 3 race starts, all were abandoned before reaching the windward mark as the wind dropped below 6kts. These abandoned races were either met with deep frustration or relief by the UK competitors depending upon whether they were leading or buried at the back of the fleet! The Storm. 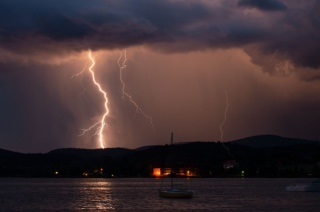 Everything changed on Friday night when ‘Lake Placid’ turned into the ‘shores of Mordor’…. For hours before it hit, the distant mountains were spectacularly illuminated by an electrical storm, which was enjoyed by the competitors as they revelled at the organised Beach Party. At just after midnight, the storm front hit and brought 50mph+ winds torrential rain and a hailstorm. Whilst most headed for cover a few brave souls ran to the boat park to try to save the boats. A special ‘Mention in Dispatches’ goes to Theo Galyer for braving the storm and preventing any RS700 being blown over or damaged. Unfortunately many of the other classes or his tent didn’t fair so well. Whilst nobody appeared to be too seriously hurt, one RS700 sailor had to retire having been hit by a flying RS Aero, and there had been a stream of ambulances attending the adjoining campsites. The power of the storm clearly left its mark for all to see the following morning. Day 3. With decent wind predicted for Saturday, the race committee were confident of completing a number of races in order to regain some of the lost ground over the preceding days. 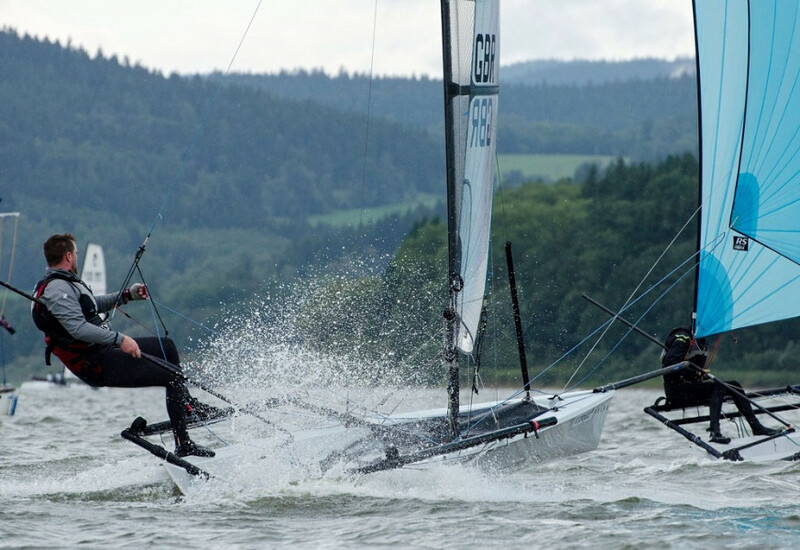 The first race took place in the morning with Milan Hajek (the Czech National Champion) showing the rest of the pack a clean pair of heels in relatively light wind to easily take the first win. For the UK sailors there was an eerie familiarity about a dark grey boat sailing clear of the rest of the pack! The battle for 2nd place was very close with 5 boats crossing the line in a near photo finish, but Spike Daniels claimed 2nd with Ian Nolan taking 3rd. The fleet returned to shore for lunch and in a building wind in the afternoon managed to complete a further 4 races in powered up trapezing conditions. In the second race Milan took the honours again with relative ease and it began to look like this may be a one-horse race. At this point Richard Wadsworth came out of relative obscurity to win races 3 and 4 and claim a 2nd place in the final race of the day. At the end of the day Milan was leading, Richard was second and a very consistent Colin Dacey was in third overall; holding off Petr Fiala who had had a number of top 3 finishes. Day 4. With a Force 3-4 forecast for the final day the race committee were confident of achieving a further 4 races to complete the championship. The first race was started with a 6-8kt breeze, which swung to the left during the start sequence. Whilst the majority of the fleet had already made their mind up the start at the committee boat end, Richard and Colin spotted the shift and made a great start at the pin end. Richard and Colin consolidated this lead throughout the race, to only have their ‘one’ ‘two’ cruelly taken away when the race was abandoned as they approached the finish line (due to wind strength). As it happened, it made little difference to the overall results as in the building wind strength Milan showed his class over the remaining races, to take 4 wins and seal the Championship in deserved style. Richard consolidated his second place and Colin claimed third place overall from a very close challenge from Petr. Whilst not featuring in the overall top 5, fellow Brits Ian Nolan, Spike Daniels routinely showed great speed to appear in the top 3 around the racecourse, but suffered some poor luck with equipment failure and other sailors capsizing in front of them at in-opportune moments. The increasing wind strength on the final day, also allowed ‘big Theo’ to stretch his legs and achieve a very rewarding 4th place. Graham Blake also posted some solid results throughout the Championship despite having only limited time on the water this year. Final results at link below.